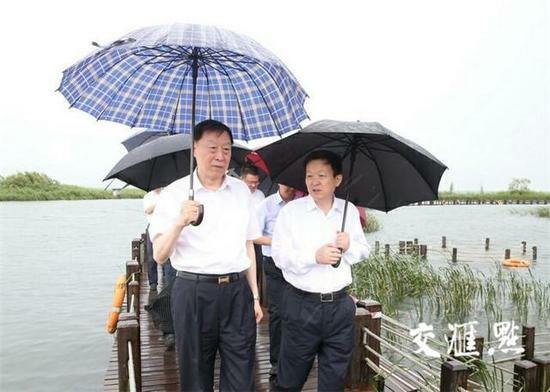 After weeks of wondering, Jiangsu authorities are now very worried about the rising waters in the province. Their unease is taking two forms. One of those is natural. That is, water levels are already rising at a steady rate here because of increased local rainfall. Nanjing and many of its suburbs have experienced heavy if scattered thunderstorms for a number of successive days and nights. At the same time, the irregular nature of these storms is clearly confounding forecasters, who’ve been having a great deal of trouble predicting just how much rain and where it will fall in “Nanjing”, a metropolitan area that’s no longer just a large city on the banks on the Yangtze River but now encompasses townships 25-30 km in every direction. In any event, the timing for Nanjing and its various localities is lousy, because the Yangtze River nearby is now taking on more water from flood runoff upstream. Meanwhile, the rain that’s been raging in Zhejiang province next door is affecting the delta region to the southeast of Nanjing. Lake Tai [太湖], the region’s largest fresh water lake, is now over flood stage, and the cities of Suzhou, Changzhou and Wuxi in Jiangsu have reached the warning level just below actual flooding. Furthermore, the timing of this new round of rain is made even more challenging by the fact that it’s high tide off China’s eastern coastline at the moment, making it more difficult for water to drain into the ocean, as well as putting more pressure on the province’s dubious dike and reservoir system. 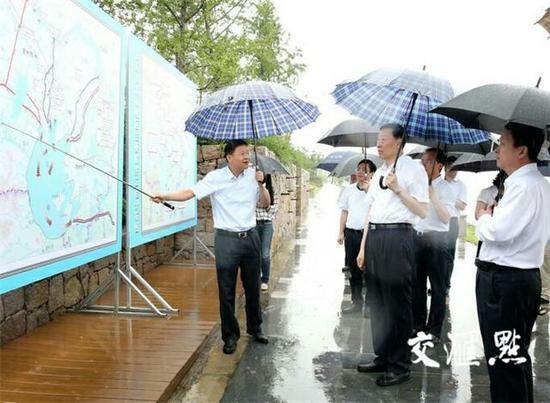 In short, there’s more water coming to Jiangsu and pretty much nowhere to put it. This rapidly developing situation led the Jiangsu provincial government to convene a meeting here this morning of “the relevant departments and work units” [有关部门和单位]--a conference to coordinate the response to the flooding that’s happening and that yet to arrive. Officials were instructed to “do their best work, pay close attention to changes in rainfall and weather, strengthen flood control and forecasting, and provide a scientific basis for decision-making”—the latter being less an instruction than clearly a cry for help in making the right choices. This isn’t going to be easy. The other source of worry in Jiangsu turns out to be political. That is, whether local officials are actually up to the task of meeting the floodwaters head on. An editorial in today’s Nanjing Daily expressed some doubts. The commentary, entitled “Flood Prevention and Disaster Relief, Better To Be Late Than Never”, [防汛减灾，多未雨绸缪少亡羊补牢] admonished local officials “not to stay hidden”, to “investigate early, so as to be able to intervene early”. “Stepped-up inspections of dikes, reservoirs, hydropower stations, sluices and other flood control projects are essential”, the editorial insisted, as was follow-up work to deal with disasters because “accidents will happen”. This editorial isn’t just a set of instructions, but an unsubtle reminder to officials of what their predecessors tended to practice in previous disasters: a propensity to wait for Beijing to issue instructions before acting, too much caution for fear of censure, an unwillingness to be inventive—all of these are part of the general critique of cadres that Party leader Xi Jinping has been making since he took office. The commentary in Nanjing Daily wouldn’t have appeared out of the grey skies unless there was genuine nervousness about how local officials will respond when the waters rise. And that’s because political reputations are at stake. In a meeting held 2 days ago (but only mentioned this afternoon), Jiangsu’s boss Luo Zhijun [罗志军] reminded local officials that 6 years ago the province embarked on an extensive flood control and prevention project for Lake Tai (also a major water source for cities in the eastern part of the province) and said that he therefore expected Jiangsu to “win this battle in the protracted war” against flooding in the delta region. Luo is clearly worried for the public welfare, and also the political: He’s giving commands to cadres to make sure that they do their jobs, so that he and others can keep theirs. It all may turn out fine in the end, for there are many fine officials in these parts. But there are nonetheless difficult days ahead for Jiangsu, for Nanjing, for its residents and their local rulers. It’s worth pondering about the possibility that floodwaters may not be the only things rolling in Jiangsu in the coming weeks.